An indie game designer I’ve circled on G+, Greg Christopher, posted this link today, as a tool for GMs, and I thought it worthy of reposting. Neuroglyph really hit the nail on the head, and I told him so. I’ve mentioned why here before. 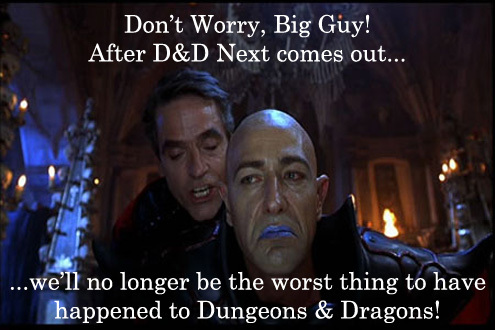 I guess I’m so focused on this because I really think D&D 4e is an extremely solid system. A lot of the things I hear a lot of players complain about (when they don’t say some vacuous argument like “you can’t roleplay in 4e”) aren’t bugs, but features to me.